Allen signed a three-year deal with the Heat for just over $9 million. The deal with Miami was $3 million less then what the Boston Celtics offered. However, the Celtics offer was for two years at $12 million. Allen would have made $6 million per year with Boston, but chose to sign with Miami for roughly $3.09 million per year. The Celtics were rumored to even throw in a partial no-trade clause as part of the deal and even a kicker if he was traded before his contract expired. This proved to be not enough for Allen, as he chose to take his talents to South Beach and will play along side LeBron James, Dwayne Wade, and Chris Bosh for the next three seasons. Celtics fans may be furious that he chose to play for the enemy, but they will have to realize that it’s a business. Players change teams every single day. And let’s be real, who wouldn’t have done the same thing Allen did? If you made several million dollars playing the sport you love to the point where money was no longer an issue and you had the chance to play with a couple of the best players in the game while knowing you have a legitimate shot at winning a title each year you are under contract, you wouldn’t do it? I find that hard to believe. Celtics fans will have to wake up and realize that even though he left, he did help Boston raise its first banner in 22 years. Allen has a great run with the C’s, and will be greatly missed. I guarantee Allen will receive a standing ovation his first game back in Boston. If Celtics fans prove me wrong, then something will be clearly wrong with the people in the TD Garden that night. 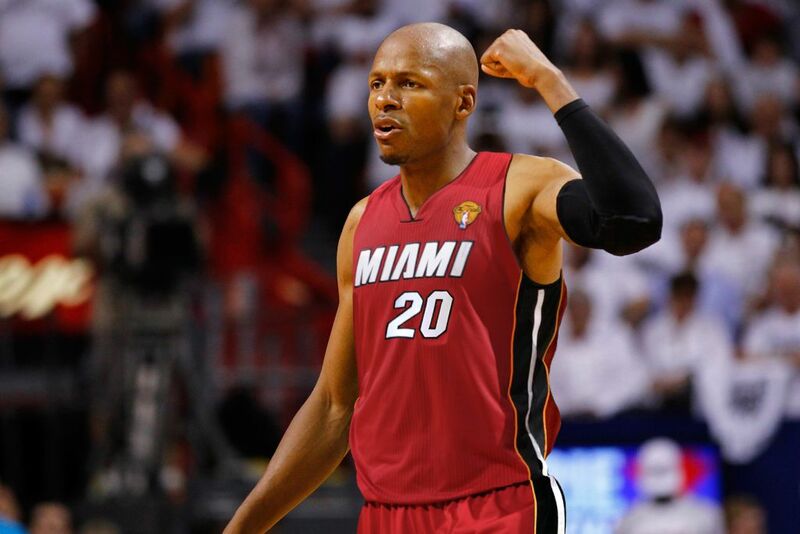 Ray Allen to the Heat? We may have seen the last of Ray Allen in a Celtics uniform. LeBron James just posted this picture of Ray Allen in a Miami Heat uniform on his Facebook and Twitter pages. Does he know something that we don’t? Is Ray-Ray heading to South Beach? I guess we will just have to wait and find out. I really hope he finishes his career in Celtic green. Stay in Boston Ray! I am so glad that this never happened to me the numerous times I had to pull tarp for the New Hampshire Fisher Cats. 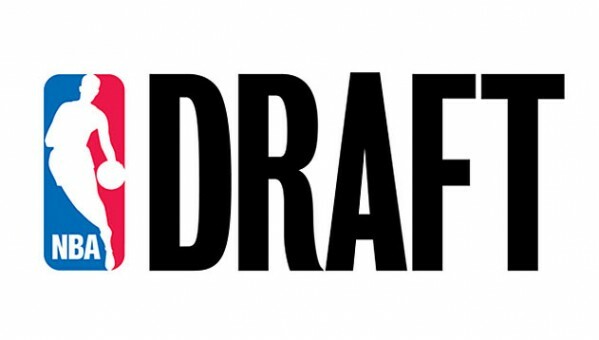 The 2012 NBA Draft is tomorrow night at the Prudential Center in Newark, New Jersey starting at 7:00 p.m. EST and will air on ESPN. We all know that Anthony Davis, the star freshman from the Kentucky Wildcats will be the number one overall pick by the New Orleans Hornets. After that, it’s anybodies guess who goes where. The Boston Celtics hold the 21st and 22nd overall selections in the first round of the draft, and the 51st overall selection in round two. Rumors have been flying around that the Celtics will try and move up in the draft. These rumors have been quickly dismissed by Celtics President of Basketball Operations, Danny Ainge. I hope that Boston keeps both of its two first round picks tomorrow night. They need all of the help they can get with Kevin Garnett considering retirement and Ray Allen thinking about signing with the Los Angeles Clippers or the Miami Heat. 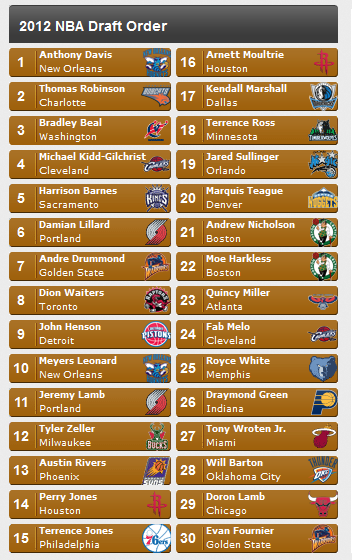 (Keep in mind that the Houston Rockets own the 12th, 16th, and 18th picks currently due to trades, while Milwaukee Bucks have the 14th pick. This machine was created before the latest trades occurred.) This is a very deep draft, and it will be interesting to see who ends up where. Stay tuned. Every time I watch this it cracks me up. I know it’s coming and I still laugh no matter how many times I watch it. Wow…this is my first post in nearly two months. Man, how time flies. In the nearly two months since my last post numerous things have gone down in my life and in the wide world of sports. For myself, I graduated college on Mother’s Day with a Bachelor’s Degree in Sport Management, as well as minors in Sport Communication and Law & Business. I obtained my first full-time job, working for Nike. It sure is a dangerous place to work. Four new pairs of shoes, nine shirts, five pairs of shorts, two pairs of pants, and twelve pairs of socks later, I basically have a whole new wardrobe. I am also in the process of looking at continuing my education and going on to graduate school. The Boston area has been my home for the last four years and is where I want to continue to be. Hopefully everything pans out the way I hope it will. Enough about me, and on to the world of sports. Since my last post numerous things occurred. My favorite Boston Bruins were eliminated from the playoffs by the Washington Capitals, and the Los Angeles Kings defied the odds and became the first 8-seed in NHL history to hoist Lord Stanley’s Cup. Even though the Bruins didn’t go back-to-back I am glad the Kings won. Growing up, I have gone to so many Manchester Monarchs games, the American Hockey League affiliate of the Kings, I can’t even count. Numerous guys that I have seen play in Manchester raised the Cup above their heads this year, including the Conn Smythe Trophy winner this year Jonathan Quick. Bruins goalie Tim Thomas told everyone that he will take a year off from the game he loves to focus on “the 3 F’s.” This being family, friends, and faith. As a result, Tuukka Rask will be the Bruins starting goalie next season, and more than likely for many years to come. The 2012 NHL Draft took place in Pittsburgh, Pennsylvania last week and the Bruins made goaltender Malcolm Subban of the Belleville Bulls the 24th overall selection. Malcolm is the younger brother of Montreal Canadiens defenceman P.K. Subban. As you can imagine, a sibling rivalry is now brewing. The Boston Celtics were eliminated by the Miami Heat in Game 7 of the Eastern Conference Finals. The Heat went on to beat the Oklahoma City Thunder in five games in the NBA Finals. LeBron James finally captured his first title and will now have a ring to call his own, as well as a Finals MVP. Tiger Woods won the Memorial Tournament by five strokes to push his career wins total to 73, tied for second all-time in PGA Tour history with Jack Nicklaus. Jerry Sandusky was found guilty of 45 of 48 charges he faced and will spend a minimum of 60 years in prison due to his actions while at Penn State. The Arizona Wildcats won the NCAA Division-I College Baseball National Championship, knocking off the defending champion South Carolina Gamecocks in two games. Lastly, Kevin Youkilis saw his time run out as a member of the Boston Red Sox. The under performing and injury prone third baseman was traded to the Chicago White Sox to make way for the emerging Will Middlebrooks. Zach Stewart and Brent Lillibridge were sent to Boston in exchange for Youkilis. Boston is 8-2 in its last ten games and is now 40-35 on the young season. These past nearly two months have certainly been interesting for me personally and for the sports world. Now that I’m back, be ready for more posts to come. The legend of Nate Ebner is consuming all of New England. The Patriots’ sixth-round draft pick was initially met with the lice effect, as many in the NFL universe scratched their heads while trying to figure out Ebner’s deal. He was listed as an Ohio State safety, but he only played three snaps on defense last season. And his biography had more impressive details about his rugby career than anything he’s done in football. On paper, the pick didn’t make any sense. Then, his rugby highlight video surfaced. After that, he met the New England media, and his passion and personality revealed a genuine, dedicated athlete. Paul Haynes backed it up. Haynes, who is currently Arkansas’ defensive coordinator, worked closely with Ebner throughout his career at Ohio State. Haynes was the Buckeyes’ co-defensive coordinator and safeties coach, and he had a couple of mutual connections with Ebner before he walked onto the team. The former rugby star didn’t have an ounce of organized football experience to his name. “He has a passion for being great,” Haynes told NESN.com Tuesday. Ebner’s father was murdered during a robbery in 2008, and the horrific event changed Ebner’s on-field work ethic, Haynes said. “His work ethic, his passion to be great — you knew by any means necessary, he was going to go out there and make a play for you on special teams,” Haynes said. “The only reason he probably did not play safety for us was just his lack of knowledge of playing [defensive back]. He was full steam ahead. He was just a downhill player, but you knew on kickoffs, on punts, he was going to be the first guy down there to make the tackle. You banked on it. You counted on it. It was going to happen. Ebner was going to make the play. Then, Haynes dropped the most eye-opening bomb. Ebner earned the nickname, “Leonidas,” a Greek hero who was portrayed by Gerard Butler in the movie 300, because of his intense workout regimen, as well as his beard. And every night before bed during Ohio State’s football camps, Ebner forced his roommates to do an insufferable amount of pushups, an act that took on a life of its own with the team. How many did Ebner do? To clarify, Haynes said he was just throwing a number out there, but with the stories that have emerged about Ebner, that amount of pushups doesn’t sound completely inconceivable anymore.Insane. But not inconceivable. Ebner will have to cut his teeth as a special teamer in the NFL, but with his intensity in the nasty side of the game, it should be a good fit for him, particularly with his skills in the open field. Ebner might get a chance on defense in a few years, but he’ll have to learn the mental aspect of that side of the ball first. Ebner, who was drafted Saturday, hasn’t even been a Patriot for a week, but he has already been one of their most heavily discussed draft picks. The tone of those conversations has been fun, and there’s a lot of anticipation to watch him play during training camp. Haynes was as excited as anyone. He didn’t think Ebner would get drafted, let alone in the sixth round, but Haynes was convinced Ebner would be successful once he linked up with a team. Ebner has always been a coach’s dream, and that was part of the reason why Belichick targeted him earlier than anyone expected.